Before Lighting up: Fresh cedar wood notes, with some hints of spices. Remember the particular cedar wood (but creamy) smell given off when you just open a D4 box. Burning: A marvellous draw. 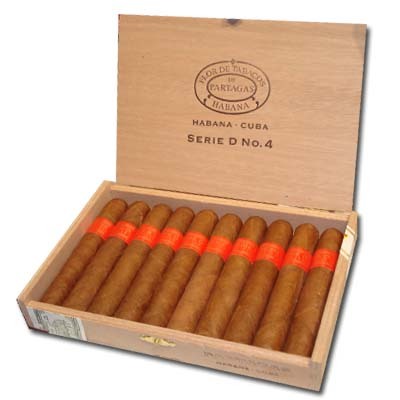 Very generous smoke, marked by a special earthiness, with some fresh cedar wood notes. A particular taste of tanned leather is present in the first third (remember the creamy smell mentioned while opening the box). 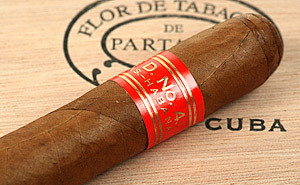 In the second third, the cigar is woody, with some spicy notes and rare hints of nutmeg. Final: Hot, spicy and dry, with hints of black pepper. This impressive red ring cigar is a legend.